New Delhi, Mar 20: Hitting out at the Congress, Prime Minister Narendra Modi on Wednesday said the Opposition party's 'Chowkidar Chor Hai' campaign had insulted all the watchmen of the country as the task of the 'naamdaar' (dynast) is to spread hatred. In a unique outreach with about 25 lakh security via an audio conference, he said endowed interests were indulging in a misinformation campaign targeting the watchmen as they "want to abuse me". "I want to apologize as some people in last few months for their vested interests have run a disinformation campaign against 'chowkidars'. It is unfortunate that the language of these people has hurt you," Modi said. "They are saying 'Chowkidar Chor Hai' (watchman is a thief). They want to abuse me. The job of these 'naamdaars' (dynasts) is to spread hatred. Even if a 'kaamdar’ (worker) becomes a Prime Minister, these people will continue abusing," the Prime Minister said during in the programme during which he took questions also. Referring to his 'Mai Bhi Chowkidar' campaign, he told the watchmen, "You must have noticed that these days everywhere it is you who is being discussed, be it TV or social media, be it in India or abroad. Today every Indian is saying 'Main Bhi Chowkidar'. This campaign is now the flavour of the season." Lauding the watchmen for doing their duty religiously despite the vagaries of weather, the Prime Minister said he has great respect for them and that inspired him to take up the 'Main Bhi Chowkidar' campaign. Reiterating that his government will not spare the corrupt, Modi said: "Our job is like yours. I am a 'chowkidar.' There are some people who want to ruin the country. If no one keeps a watch, they will take advantage. But, when a 'chowkidar' is keeping a watch, they are reined in." Slamming the Congress for criticizing the 'Mein Bhi Chowkidar' campaign, the Prime Minister further said: "If they had respected the 'chowkidar', then a huge amount of money would have been prevented from going out of the country. This money would have been useful for the people in the country." 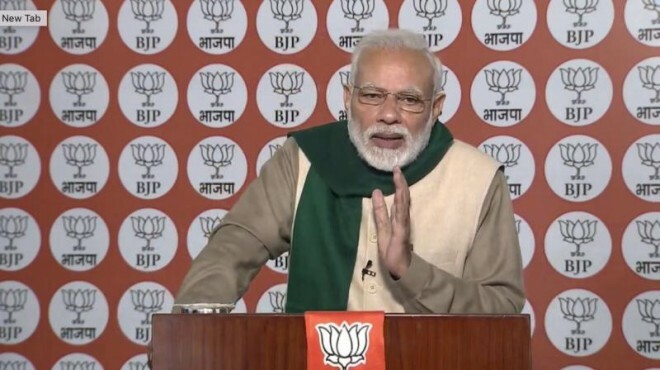 Responding to a question about Balakot air strike, Modi slammed those who have been raising questions over the action. "Everyone should be proud of our armed forces. They sacrificed their lives for all of us. These 'tukde-tukde' gang cannot digest the fact that the armed forces carried out the air attack deep inside Pakistan," he said. "When bombs were dropped in Pakistan, some people were shouting in India... Vaar Pakistan me hua, bimar Hindustan me hua (attack took place in Pakistan, trouble was felt in India by some people). How can the nation tolerate this," the Prime Minister said, making a veiled attack on those raising questions over the air strike. While slamming the Opposition, he said their statements on the Balakot strike created headlines in Pakistan. "Their words are being heard in radio and are being published in newspapers there. Even in their Parliament, their statements (Opposition) are being endorsed," he said.